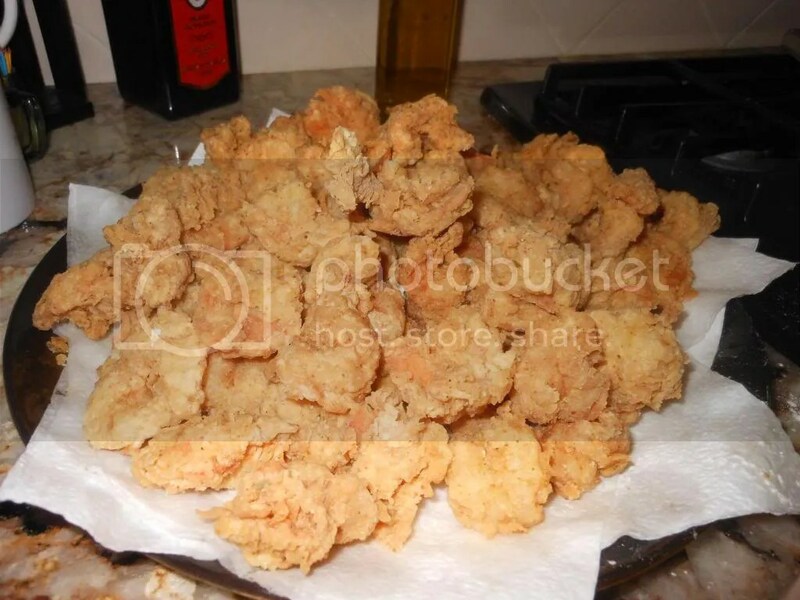 Fried Shrimp is one of my specialty dishes that I cook on special occasions. It’s one of those recipes that is not measured by cups and teaspoons, but by touch and specific name brand ingredients to insure that the taste is always a high quality. Make sure to use the the name brands because others will not provide the same quality taste. Peel, rinse and then butterfly shrimp by cutting a slit a little deeper on the back side of the shrimp allowing the shrimp to open up a little more. Use a large heavy duty skillet. Fill skillet with LouAna Cooking Oil (enough to cover shrimp) that will fry consistently while maintaining the heat. Turn burner on medium to start heating cooking oil. Place about two cups of flour in a dish, salt liberally with the garlic salt and mix together. Place shrimp in a large bowl and break eggs over shrimp and stir to cover completely. Dredge shrimp in flour. Test oil by dropping a splash of flour into skillet if it rises then oil is ready. Drop shrimp into oil, careful to not place too many in skillet. Allow shrimp to turn a light golden color like the picture turning after two minutes to other side. Shrimp will cook very fast so watch carefully. Enjoy! Previous Post Do We Have To Do School Today?